Something big is coming to the Pittsburgh food truck scene — a Greyhound bus, to be exact. 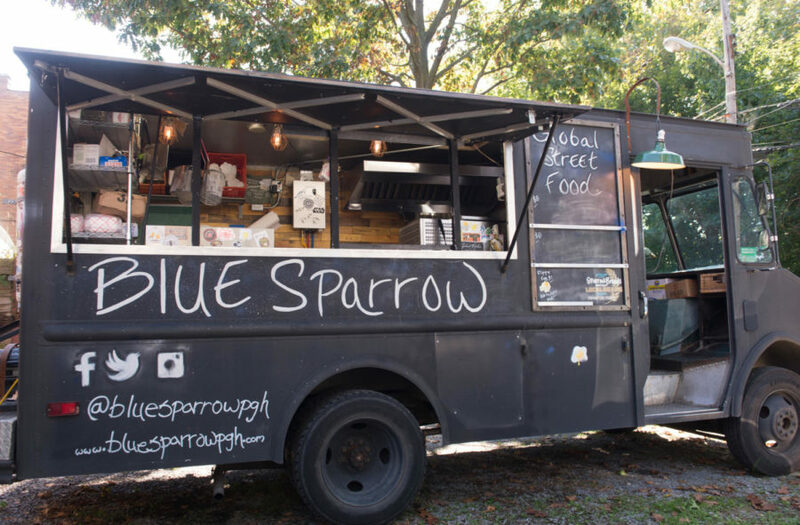 Blue Sparrow — a food truck that sells global foods ranging from a ramen burger to traditional gyros — is expanding from its current truck to a 1956 GM PD-4104, a bus known as a “Highway Traveler” while it was being produced. One of its previous stops was outside of Redhawk Coffee on Meyran Avenue, but the owners have had to ease up on lunch service to devote time to developing the new bus. They hope to pick up lunch spots again when the bus is ready for use. The Greyhound’s size will multiply their kitchen space when they are out serving different sites. Pittsburgh chef Luke Cypher owns and operates the food truck with help from with sous chef Zack Morgans and confectionarian Jess Wagner. The trio is looking to add the transformed bus to the Blue Sparrow’s lineup in November to help enhance efficiency in the kitchen and expand their menu. “The idea is to give us more space and a faster serving area,” Cypher said, adding that the bus will increase the ordering and serving area by threefold. Cypher worked in brick and mortar restaurants before opening the food truck so he could make good food, choose his own hours and have good customer interactions. He chose the name Blue Sparrow to reference old sailor culture. Cypher and Morgans got the inspiration for the Greyhound bus after seeing a double decker bus in the City. They found the bus, which had been converted to an RV, on a Facebook bike swap page, and drove out to see it in Cumberland, Maryland, the next day. Originally, they thought about having customers come onto the bus to eat, but dropped the idea due to insurance and health department regulations concerning the propane tanks in the bus. Customers who want to see the inside of the bus can take a look inside when the bus is completed. Morgans has worked to transform the secondhand Greyhound into a working food truck for the past month and a half. He took the walls out, replaced the floors, put in a kitchen and polished the aluminum outside. Their current food truck is 10 feet by 7 feet, while the new bus is 8 feet by 30 feet. In the coming months, the crew plans to winterize the new bus to sell food through the winter, which they weren’t able to do in previous years. When spring comes around, they will try and figure out a way to sell food from both their original truck and the new bus. Since it first opened in August 2016, Blue Sparrow’s original dish — a take on the Vietnamese Banh Mi sandwich — has been a top seller with their customer base, Wagner said. New additions to the menu also garner plenty of curiosity. On Tuesdays, known as “Prep Day” on the bus, the three-person crew works together at their kitchen space in Avalon to begin the process of making their menu items from scratch. They bake their own rolls, pickle their own vegetables, and make their kimchi and sauces from scratch before they set up shop outside of different coffeehouses and breweries from Wednesday to Saturday. The food truck, which Cypher said feeds between 50 and 300 customers a day, serves options for people with different dietary preferences as well. Cypher said the Blue Sparrow unintentionally obtained a vegan following after they first opened in 2016 because of their variety of choices on the menu. Though Blue Sparrow draws its inspiration from global dishes, the crew put their own spin on their recipes as well. In the production process, all three members provide input to develop their newest menu items.